The First Creek Fire burned close to Lake Chelan when it first broke out in mid-August. It has since headed in northerly and westerly directions. 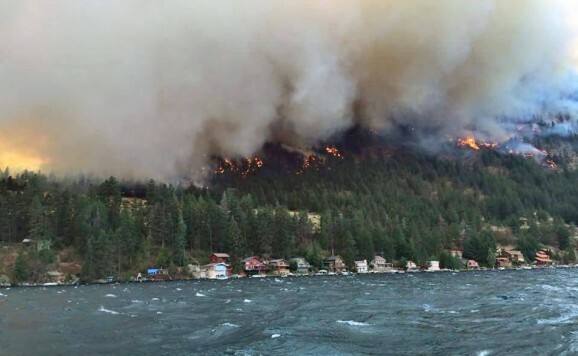 MANSON — The Sept. 12 Lake Chelan Shore to Shore Marathon has been canceled due to wildfires burning in the region, organizing group RunWenatchee announced today (Aug. 26). As of now, the plan is still to hold the event’s half-marathon and 10K races that day, with the half-marathon utilizing a new course. There is no fire activity near the half-marathon or 10K courses. Rain is forecast to fall in the region this Saturday (Aug.29). A portion of the proceeds from the half-marathon and 10K will go to a fire victims relief fund. 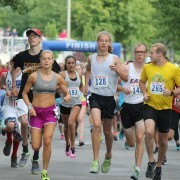 “The health and safety of our runners is our number one concern,” Rhyner said. “We would never want to put any of our runners in harm’s way, nor would we want to hinder any of the firefighting activity going on in the area. While there are no active fires burning in the direct vicinity of the towns of Chelan and Manson, firefighters have been battling blazes along or near Lake Chelan since late June and further north in Okanogan County since mid-August. As of Tuesday, more than 404,000 acres had burned between the Chelan and Okanogan fires. Dozens of homes and structures have burned and sadly three U.S. Forest Service firefighters lost their lives in the Methow Valley last week. Because the entire stretch of South Lake Shore Road has limited access, the half-marathon will now start at the City of Chelan’s Lakeside Park at 8 a.m. From there it will head west on Highway 97A to a turn-around spot near the intersection of Highway 97A and South Lake Shore Road, and then proceed to the finish in Manson on the regular half-marathon course. The 10K course will remain the same, starting near the Chelan Shores development along Highway 150 at 8:30 a.m. and continuing to the finish in Manson. Marathoners must let organizers know which option they are choosing by emailing info@runwenatchee.com by Sept. 5. If they want a race shirt, they must also provide their mailing address in that email. A portion of the event’s proceeds will go to fire victims. Rhyner said the Chelan Valley Fire Relief Fund is being administered by the Community Foundation of North Central Washington. For more on that effort: http://www.cfncw.org/. Shore to Shore Marathon, Half-Marathon and 10K was started in 2001. The 2014 race attracted about 600 runners, many of whom came from different parts in the United States. Economic development officials estimated the 2014 Shore to Shore Marathon, Half-Marathon and 10K generated about $300,000 in spending for the local economy. 1. Receive a 30 percent reimbursement of your registration fee (less Eventbrite fees). 2. 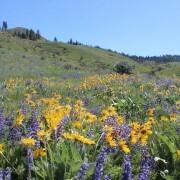 Have the 30 percent reimbursement of your registration fee (less Eventbrite fees) donated to the Chelan Valley Fire Relief Fund. 3. 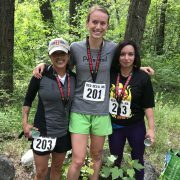 Receive a transfer entry into next year’s Lake Chelan Shore to Shore Marathon, Half-Marathon and 10K. 4. Drop down and do either the Shore to Shore half-marathon or 10K on Sept. 12. Please note there will be no refunds given out at the event on Sept. 12. All the shirts have been ordered, paid for, and been printed. If you registered for the marathon prior to the deadline (Aug. 15) to be guaranteed a shirt, we’ll be mailing those to you via the address on file via the Eventbrite sign-up that you used when you registered for the race. Please let us know at info@runwenatchee.com if that’s not the address you want us to ship your shirt to. At this point in time, we expect to hold the Shore to Shore half-marathon and 10K on Sept. 12. Because the entire stretch of South Lakeshore Road has been closed, the half-marathon will now start at Chelan’s Lakeside Park at 8 a.m. From there it will head west on Highway 97A to a turn-around near the intersection of Highway 97A and South Lake Shore Road, and then proceed to the finish in Manson on the regular half-marathon course. We will continue to monitor the fires and smoke conditions, and if needed, we will make further changes to the half-marathon and 10K. If the air quality forecast is for “unhealthy” conditions the day of the event, we will need to cancel. That decision will be made no later than Tuesday, Sept. 8.